Even though Logic Pro X offers a shredload of plugins that can make great guitar tones (or can be used creatively for distorted vocals for example), there's a whole other world of third-party guitar amp simulator plugins to explore. 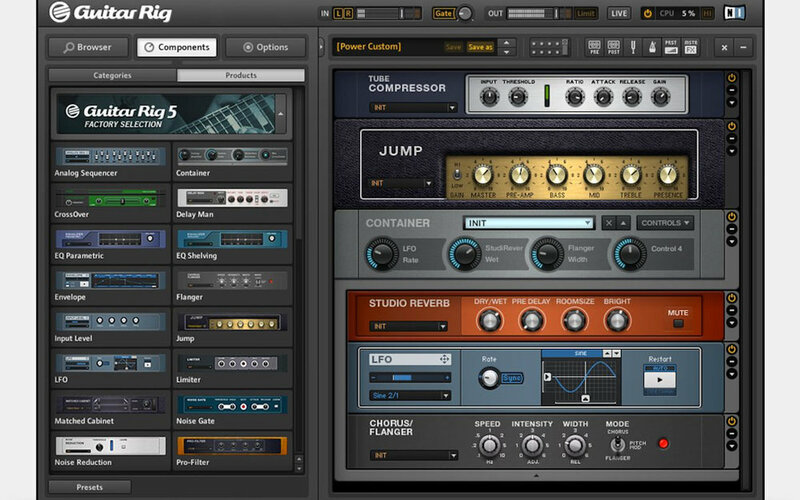 Here's an overview of some of the best free guitar amp plugins for Mac to get you started. Amplifier simulation software maker Overloud Audio Tools from Italy brings you the free version of TH3, an all-round guitar amp simulator created by legendary DSP engineer Thomas Serafini. The free edition has all the features of the paid version, just with a smaller selection of amp models. TH3 is a creative tool which allows you to craft your custom guitar tone and explore the boundaries of your instrument. You can even transform your electric guitar into an acoustic guitar, or make synth-like sounds with the built-in ring modulator. You can import Impulse Responses from third-party libraries to extend the number of guitar tones you can make. Up to 4 microphones can be placed in 6 different room types, in front or behind the cabinet. To further sculpt your guitar tone, you can alter the relative distance between the microphones, just like you would in a real cabinet room. TH3 is available as AudioUnit,RTAS,AAX64 and VST plugins, as well as a standalone application. Both 32bit and 64bit are supported. ampLion Pro has a little brother named ampLion Free, a free guitar amp plugin and standalone application based on the famous Audiffex Standalone application for guitarist's live performance. It is part of the Live Guitar and Bass Bundle, which also includes GK Amplification 2 LE, a model of a Gallien-Krueger MB150 amp and a GK speaker, and inTone 2, a virtual instrument host that enables you to combine the guitar amps with other plugins. These plugins come in the AAX, AU, VST2, VST3 plugin formats, in both 32 and 64-bit versions. The bx_rockrack V3 Player is a great freebie for getting good guitar tones quickly, from subtle re-amping to full-on distortion. The plugin, developed by Brainworx, lets you try out eight guitar amp simulations that are featured in the paid bx_rockrack V3 version ($199), with 26 presets made by professional guitar players, based on eight guitar amps. The plugin includes clean guitar tones, distortion pedals, and metal grunge presets. The user interface allows for quick preset switching while keeping an eye on which settings are being used to create a particular guitar tone. Note that the presets of the bx_rockrack V3 Player cannot be modified. You'll need to sign up at the Plugin Alliance website. After downloading and installing bx_rockrack V3 Player, you'll need to activate your Plugin Alliance account using your login credentials. The bx_rockrack V3 Player works without a dongle or serial number. bx_rockrack V3 Player comes in the AAX DSP, AAX Native, AU, VST2, VST3 plugin formats. Black Rooster, an audio software company from Germany, has some free guitar amp software up for grabs as well. They offer a plugin that's been modeled after the Cypress TT-15, a flexible guitar amplifier with just six controls. It features a 2x12 cabinet emulation that can be switched off. You can add your favorite third-party Impulse Responses, so you can cover a lot of bass guitar tones as well if you want. If you're looking for clean, vintage, crunchy or distorted guitar tones, make sure you give this one a spin! You'll need to register on the Black Rooster website in order to use this plugin. Black Rooster Cypress TT-15 comes in the AAX, AU, and VST plugin formats, in both 32 and 64-bit versions. IK Multimedia's AmpliTube Custom Shop includes a free version of AmpliTube 4, with 24 guitar effects to start with including nine stomp boxes, four guitar amps, five cabinets, three microphones, and two rack effects. After downloading and registering the software, you'll get a fully functioning standalone application for both Mac and Windows, and the plug-in version for your DAW (64-bit only). If you like IK Multimedia's guitar amp software, at a later stage you can purchase new pieces of virtual gear made by the world's top brands, including MESA/Boogie®, Fender®, Ampeg®, and Orange®. You'll need to register on the IK Multimedia website in order to use their guitar effects software. These plugins come in the AAX, AU, and VST formats. 64-bit only. For more information, visit IK Multimedia AmpliTube Custom Shop. Guitar Rig 5 Player is an expandable guitar effects processor developed by Native Instruments. It is the gateway drug to their Guitar Rig Pro software. Guitar Rig 5 Player's factory selection of free guitar effects include a British Amp with Matched Cabinet, a Skreamer distortion unit, and a Modulation unit for chorusing, flanging, and pitch modulation effects. You'll also get several reverbs, delays, and dynamics effects to play with. Supported interfaces include a stand-alone version, VST, Audio Units, and AAX Native. For more information, visit Native Instruments Guitar Rig 5 Player. Dr. Marc Gallo, who founded Studio Devil, is a member of the Audio Engineering Society with a Ph.D. in Electrical Engineering from the Polytechnic Institute of New York University. He specializes in Audio Signal Processing and DSP. He researched the behavior of power amplifiers and the spectral responses of speaker cabinets to integrate them into Studio Devil's virtual guitar amp emulators. All of Studio Devils' products are modeled after tube amps that use preamplifier stages based on the 12AX7A triode. The Studio Devil British Valve Custom is their free guitar amp plug-in. It's a British High-Gain Amp emulation based on a Marshall® stack and features a power amp Drive control, a built-in 4x12 cabinet emulation, and guitar tone controls for bass, midrange, treble, and presence. Sample rates up to 192Khz are supported. You’ll need to register on the Studio Devil website in order to download this plugin. British Valve Custom requires a VST, Audio Units, or RTAS audio host. For more information, head over to Studio Devil British Valve Custom. Audified are offering a free bass amp plugin and standalone version of Gallien-Krueger Amplification 2 Pro. Both the plugin and standalone application include an exact model of the Gallien-Krueger bass amplifier and speaker. GK Amplification 2 LE is the 'light' version of GK Amplification 2 Pro, which currently costs $39. The free version also has the option to 'pay what you want'. GK Amplification 2 LE runs on Mac OS X 10.8 and up. VST2/VST3/AU/AAX 32/64bit. Have you come across any free guitar amp plugins for Mac yourself?